On February 7, 2011, the Inter-American Commission on Human Rights granted Precautionary Measures for the Rapa Nui Nation on Rapa Nui Island (also known as “Easter Island”). This article provides some background information on the Inter-American Commission on Human Rights (Commission) and precautionary measures granted by the Commission. What is the Inter-American Commission on Human Rights? What has been the Center’s involvement with the Commission? The Center has been bringing cases to the Commission on behalf of indigenous peoples since 1979. The Center brought a case on behalf of the Yanomami against Brazil that year. The case involved the right of indigenous communities to control development in their territories and the state’s duty to prevent violence and killings of indigenous peoples. The Center assisted Miskito leaders from Nicaragua to seek aid from the Commission in the 1980s, as well as the Awas Tingni Community to redress the violation of their collective property rights to land in the 1990s. This work culminated in changes to the Nicaraguan Constitution and the creation of laws that recognized the collective rights of the indigenous peoples to their lands, territories, and natural resources. Other cases include the case of the Maya of the Toledo District against Belize, and the case of Mary and Carrie Dann against the United States. Through these cases, the Commission has recognized that the collective human rights of indigenous peoples are protected through the American Declaration on the Rights and Duties of Man and the American Convention on Human Rights. Today, indigenous peoples in the Americas rely on the Commission and the Inter-American Court of Human Rights for protection when their rights have been violated. 1) Issues Precautionary Measures. The Commission can issue recommendations to a country to take actions to prevent “serious and irreparable harm” to the human rights of individuals or groups. 2) Processes cases. These are brought as petitions by individuals and/or groups, including indigenous communities to redress human rights violations. It often takes the Commission a long time to process each case because of the complexity of the process and the fact that the Commission receives more than a thousand petitions every year. 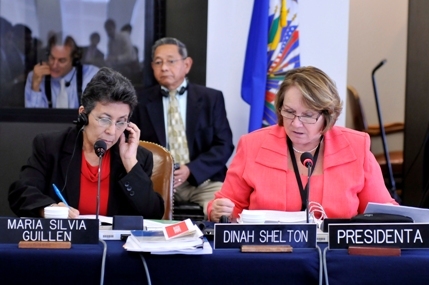 The Commission can refer cases to the Inter-American Court of Human Rights if countries fail to resolve human rights violations found by the Commission. How does the Commission grant Precautionary Measures? What happens after the Commission has granted Precautionary Measures? First of all, the most important reason to bring an issue to an international body is to raise awareness of human rights violations. Countries are less likely to continue violating human rights when others are watching. On a more technical level, after the Commission grants Precautionary Measures, it asks the targeted country to take appropriate measures in order to implement the Commission’s recommendations. In so doing, the country must file a report concerning its implementation. The Commission continues to follow up on the situation until it is satisfied that the beneficiaries of the precautionary measures are no longer threatened with serious and irreparable harm. That is to say, the Commission supervises the full implementation of the granted precautionary measures.